A 70-year-old male patient by the name of Henry “Hank” Salzer was admitted to The Willows at Ramapo from Good Samaritan Hospital. Henry was in need of tracheostomy management, which caused acute respiratory failure from Glossectomy due to his diagnosis of tongue cancer. Additionally, Hank also had a past history of Chronic obstructive pulmonary disease as well as Hypertension. Hank was initially on 35% oxygen via his tracheotomy collar and needed to suctioning treatment daily. It was extremely hard for Hank to speak with the staff so he communicated with a communication board. Along with it being difficult for him to speak, he received nutrition through a PEG tube. 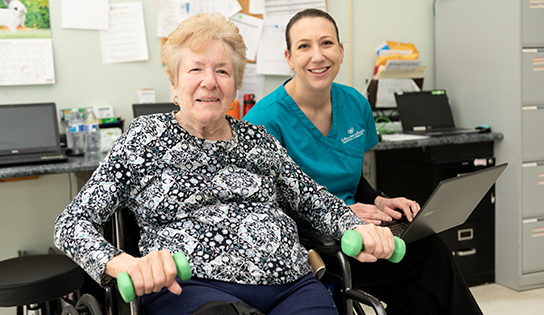 After his initial assessments by Nursing, Speech Therapy, Occupational Therapy, Physical Therapy, and Respiratory Therapy, a plan of care and goals were put into place to help facilitate a successful and safe return home. Due to his compromised respiratory status the entire team worked very closely to assure safe treatment and to maximize his outcomes. Despite his current condition, Hank strived to be as independent as possible with his daily care. He was very involved in trying to manage his trach. He was provided with education for his trach, which included cleaning of inner cannula and suctioning. Hank made a goal for himself that he would be able to perform self-care techniques at home after he discharge. With all of the collective teamwork, Hank’s progress and improvements began to increase. His goals were now changed to weaning him off the trach and eventual removal of the device. Through exercise, education, and proper trach management, he was able to be weaned off the oxygen, capped and eventually decannulated! Hank made improvements with his feeding as well. Henry was able to work his way up to eating puréed foods and regular liquids while still receiving daily nutrition through PEG. He was also educated on how to manage his PEG feedings. Hank was already very independent with self-care, so Occupational Therapy focused on pacing and energy conservation. They also worked on showering, since he wasn’t able to shower due to his trach. With Physical Therapy, he worked on strengthening and increasing his exercise tolerance. Henry did not have much family support at home so all therapy disciplines worked hard to make him as independent as possible for his safe return home. Every week Hank made improvements to work toward the goal of independence. The week before he left he was decannulated and he adjusted well to his new respiratory status. Not only was he no longer on the trach, but he had been safely weaned off supplemental oxygen. Upon discharge Henry left our community a confident new man who had the confidence to independently take care of himself for a successful return home.